Irish Olympian skier Kirsty McGarry claimed a historic victory this week at the ‘world’s craziest race’ in the Swiss Alps. BASKING IN THE AFTERGLOW of her incredible Giant Slalom win, Kirsty McGarry headed for a well-earned beer to celebrate. The result can’t be under-estimated. For the first time in half a century, the Inferno race was won by a non-Swiss or non-German entrant. Owing to its background, this is no ordinary race. The event has an illustrious history. In the late 1920s, as the various disciplines of ski-racing were being fine-tuned, members of the Kandahar Ski Club in England, led by Sir Arnold Lunn, headed to the Swiss mountain village of Mürren and took part in the very first incarnation of the Inferno. It quickly developed into a legendary and iconic annual pilgrimage. Now, 1800 competitors (amateur and professional), from 26 nations, take part and attempt to navigate the longest downhill course in the world – an arduous and dangerous 15.8km journey with a descent of an eye-watering 2100 metres. Making McGarry’s achievement even more special is the fact that she hasn’t competed in five years. 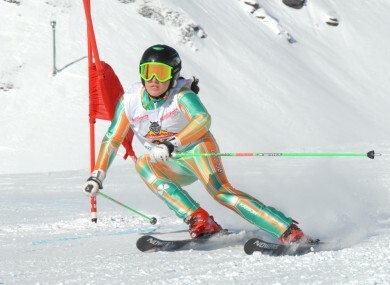 In February 2010, she represented Ireland at her second Olympics in Vancouver. Four years before, in Turin, she had been flag-bearer. But general life pressures ensured something had to give. Kirsty McGarry leads out the Irish team at the opening ceremony of the 2006 Winter Olympics in Turin. “After Vancouver, I stopped racing completely. I was in university and it was getting a bit heavy, going into my final year in Physiotherapy so I would just ski on the holidays. I haven’t managed to ski or train in the last couple of years because I was working full-time so I was just delighted that I was able to pull out a good run. This is a race I always wanted to do but I never could it when I was competing because it’s very dangerous and it takes place at the end of January when a lot of the important events are. So, I thought why not go out for fun, to see how I’d get on. So my first opportunity to do that was two years ago. The logistics of the race make it even trickier. McGarry, for so long used to copious space and the gates as her only obstacles, had to get used to the sheer volume of competitors and the beat-up terrain. The 29 year-old hit the gym hard to prepare for her latest Inferno experience. A shoulder injury derailed any hopes she had of getting much recreational skiing under her belt last year so it was a tougher slog than usual. But on such a relentless, uncompromising and unforgiving course, the work-outs paid dividends. Still, McGarry dug deep and finished less than a second ahead of her nearest challenger. Slowly, the triumph began to sink in and was aided by the reaction of the race organisers. Email “'The fact I beat a lot of the men as well...I think they're quite impressed'”. Feedback on “'The fact I beat a lot of the men as well...I think they're quite impressed'”.